3 Fall Shows, Lots of New Stuff! 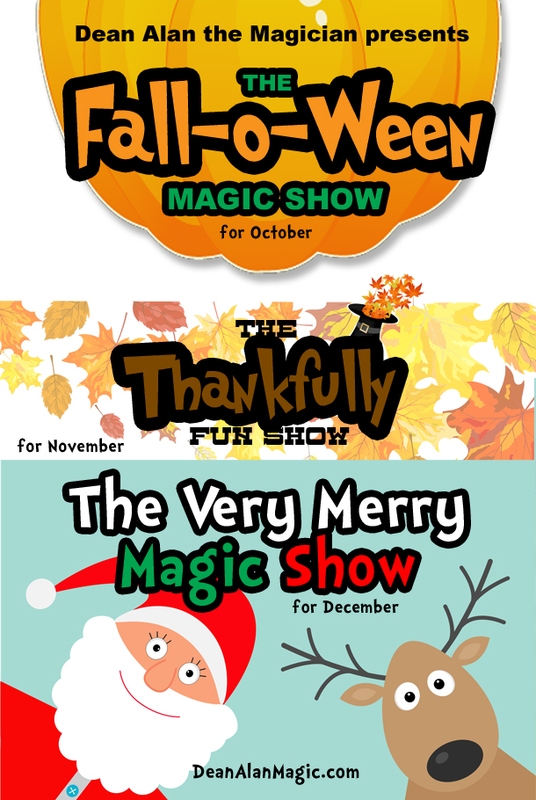 The Fall-O-Ween Magic Show 2015 starts TOMORROW! Great news, everyone that schedules the show will get a free magic trick! It is a hand-out that comes in .pdf form. It’s called the Magic Boomerang Illusion and it’s super simple and lots of fun. That’s the good news!!!! The good news, there are still open dates on the calendar! If you act quickly, I’ll do everything I can to find a place for you. So don’t wait, call TODAY 703-404-8902 or just click the BOOK A Show button at the top of the page to schedule a show! BTW, I just got re-booked at Locust Shade Park for the 5th time this year. October 24th is the date, it’s a Saturday at 1p.m. It’s going to be A Very Spooktacular Magic Show!!! And I’ll be back at The Joe Gibbs’ Youth for Tomorrow Event on October 3rd for my annual performance there. Watch the TOUR page for more upcoming public appearances. Why not join the multitude of clients who book me again and again. All you have to do is start with the first one This Fall is an ideal time to try out The Magic of Dean Alan for your event, school or daycare! October 8, 2015 in Blog.